The Joy of Gourmet Meals & Giveaways - Ideal Balance Gift Baskets! Eating good food and giving gifts are two topics I love talking about! First let's talk about food, then we'll talk about gift giving. To me, a good meal is as enjoyable an experience as you can get. 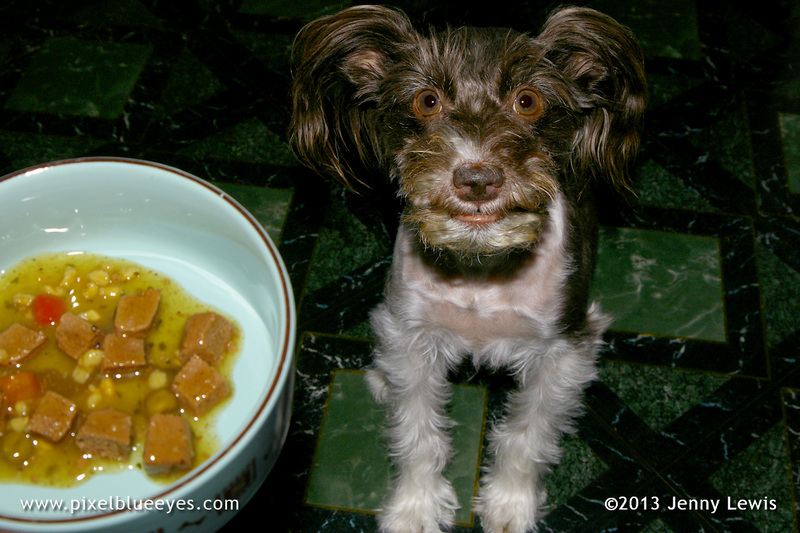 My favorite type of meal involves moist savory morsels, a little dry kibble and a lot of love. I am on a wheat, soy, and corn free diet, so Mommy is very finicky about the types of foods I ingest. I, on the other hand, just want it to taste good. I savor every bite! 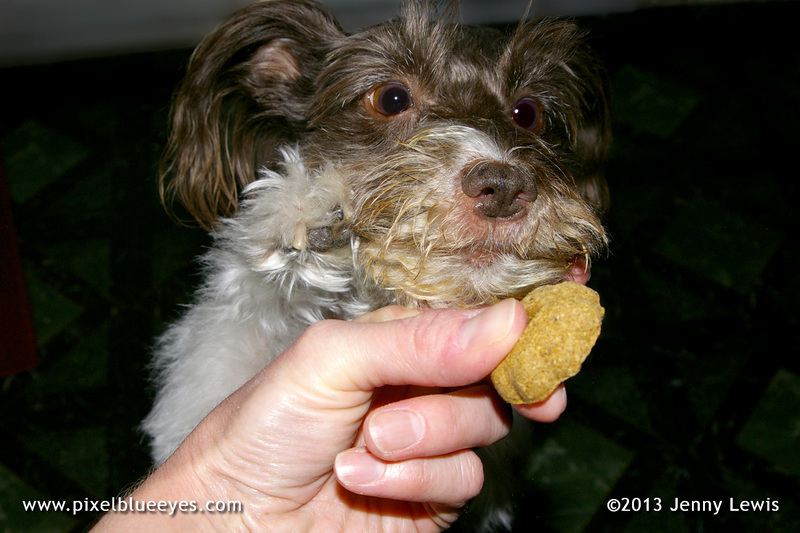 When I eat my meals or have a treat or two, I never let even the tiniest bit of food or crumb escape my clutches. 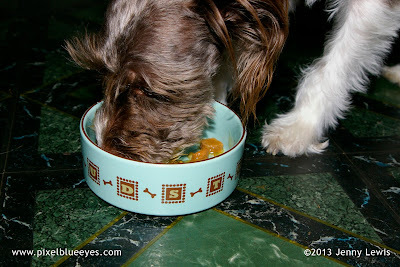 I am, after all, the official "Finder of Long Lost Kibble", so I take eating very seriously and believe a good gourmet meal that is well balanced helps keep me strong, healthy and active. My friends at Hill's Pet Food feel the very same way. They too take food very seriously and believe that a pet's daily feedings should include a combination of dry kibble (my favorite! 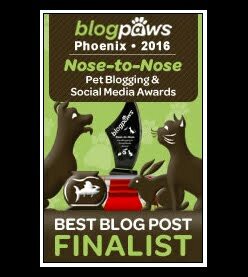 ), wet food and little treats throughout the day. Now that's MY kind of thinking! 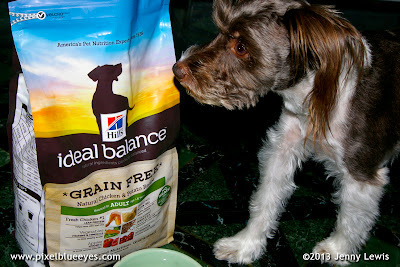 Hill's has an excellent new line of food for dogs and cats called "Hill's Ideal Balance" that is wheat, soy and corn free. Some of their recipes are Grain Free as well. Ideal Balance is a perfect blend of all natural ingredients like chicken meat, sweet potatoes, peas, and apples, plus there are no artificial colors, flavors or preservatives. When you feed Ideal Balance foods, you can be assured that your pet is getting natural ingredients in perfect balance. 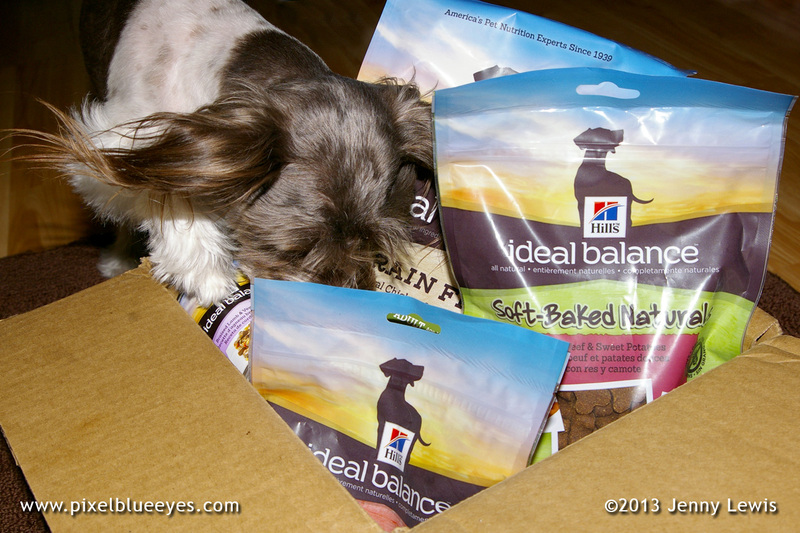 When Mommy and I wanted try Hill's Ideal Balance complimentary nutrition of wet dog food, dry dog food, and treats for ourselves, she said we would be getting a special delivery of it. I couldn't wait for that package to be delivered to our door. I hung out near the front door for days just waiting. They say a watched pot never boils. Well, a watched driveway never has the delivery man show up either. Finally, several days later, the package arrived. I was overjoyed! The moment Mommy opened up that box of heaven and started viewing the contents, I dove in before she could even see what all was inside (even though she kind of knew already). 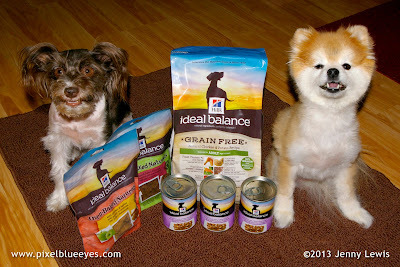 We wanted a good well balanced sampling of their dry, grain-free foods, some of their wet canned food, and some treats...a dog can't live without treats. Mommy says it's very important to feed your pet gourmet meals filled with love that combine wet/dry food and treats throughout the day. 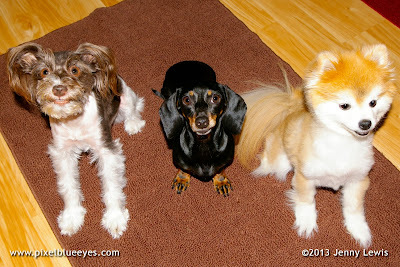 My sisters Peanut and Dixie Mae were on hand to check out what we'd had delivered. 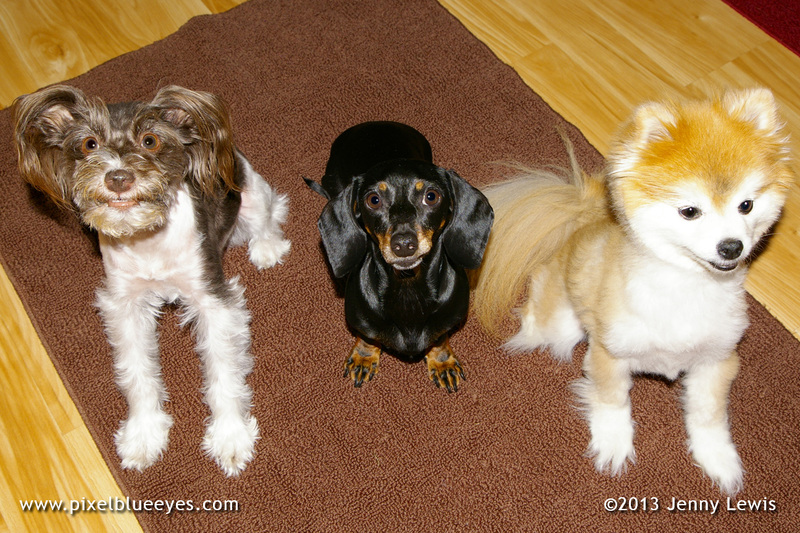 Dixie and I looked deep into Mommy's eyes, clearly letting her know we needed to try one of the treats first. "Which one do you want to try first?" she asked. 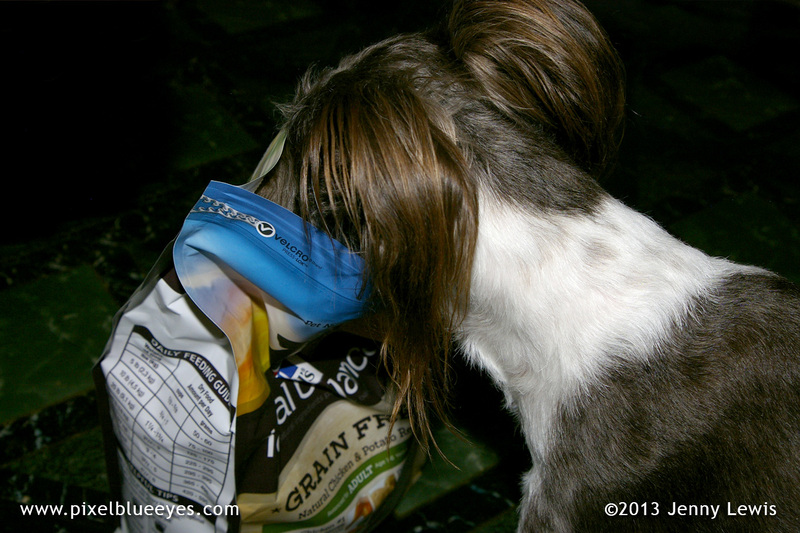 Peanut already had her eye on one of the treat bags while Dixie and I were staring Mommy down. She had picked out the Soft Baked Naturals with Beef and Sweet Potato dog treats right away. Look at how excited she was! I thought she was going to paw the bag open herself. 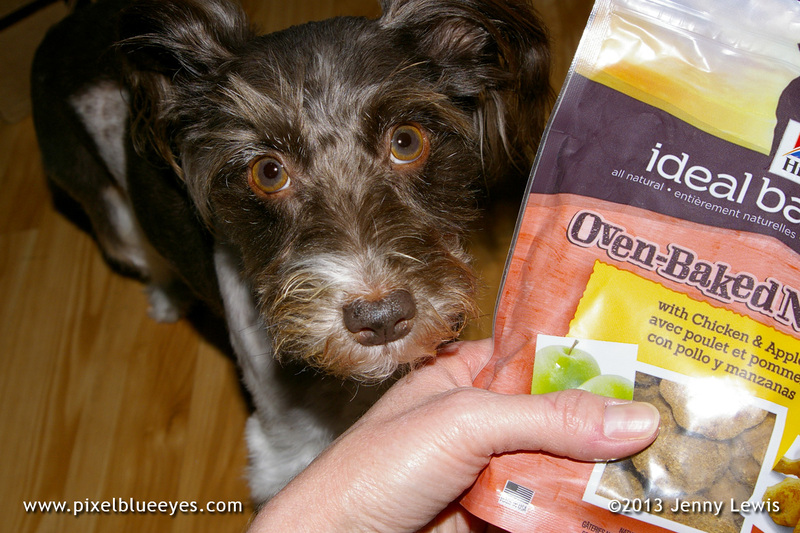 So imagine Mommy's surprise at the sheer joy and exuberance that Dixie Mae showed over the new Hill's Ideal Balance Oven Baked Naturals with Chicken and Apples treats. She was absolutely giddy about them! They say that a picture is worth a thousand words, so this photo says it all. Mommy feels good knowing that, in Hill’s tradition, making nutritious food is at the core of their philosophy; quality and safety first is above all else. 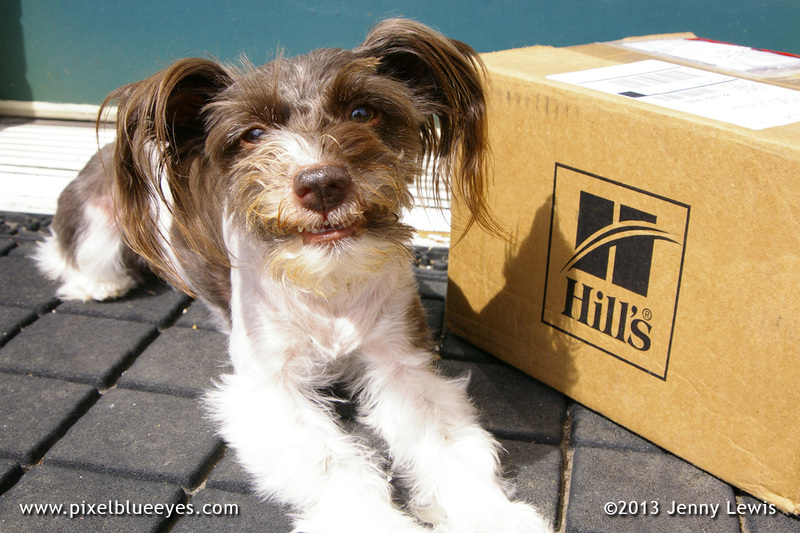 You will surely have peace of mind when feeding any Hill’s food and treats to your pet. 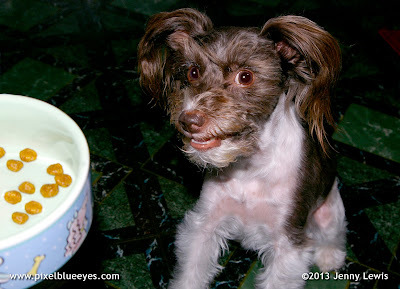 Knowing that it tastes really good and that we all love it is very reassuring, because like all pet lovers, Mommy wants us to be happy with and enjoy what we are eating. As you know from other posts of mine, Mommy works out all my meals and treats so that I am not getting over fed, but that I feel special with every tender morsel. Instead of feeding me one big meal a day, my sisters and I get several small meals that equal out to the right amount of food for each of us according to our ideal weight. So, let's talk about the logistics of a typical day for me and my food loving self, shall we? 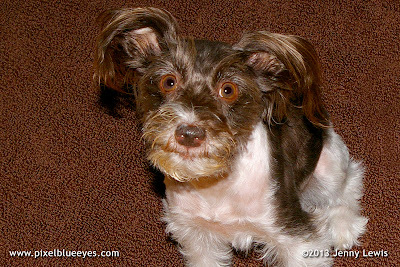 Remember, a perfect balance of nutritious gourmet meals and treats keeps me healthy, energetic and very, very happy. First off, I feel it's important to mention that breakfast is often said to be the most important meal of the day for your body. You are literally 'breaking the fast' from a night of sleeping. Pets need to break that fast just as much as humans do, so me and my sisters get an early morning meal. 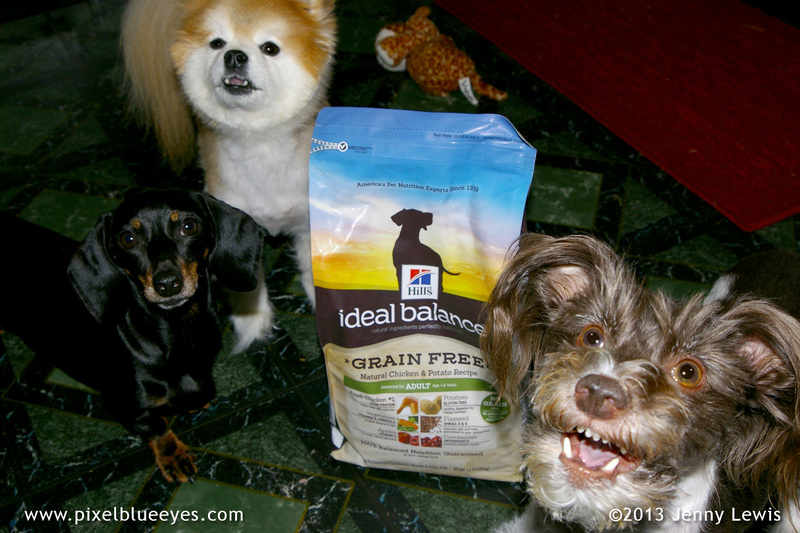 Hill's Ideal Balance wet grain-free dog food is a great way to start off the day. I tried the "Braised Lamb & Vegetables Recipe" first. That sounds like food fit for royalty! The meat pieces were pretty big, so Mommy was kind enough to cut them up into more manageable pieces for a little dog like me. 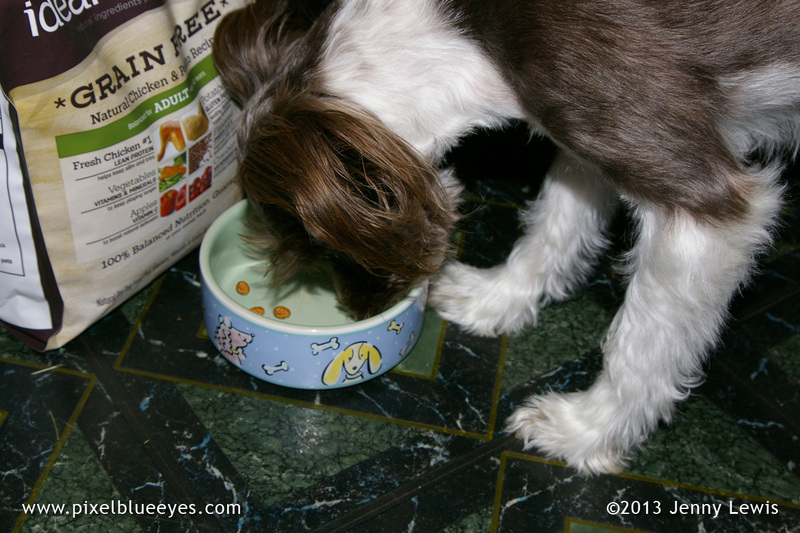 Mommy says a Princess of my stature gets special treatment when being fed a gourmet meal. I love it when she talks like that! I get fed again around midday and then in the afternoon. Sometimes it's dry kibble (kibble is my affectionate word for dry dog food pieces) and sometimes Mommy will supplement the dry food with some wet food. I absolutely LOVE the Grain Free Natural Chicken and Potato Recipe. I scarf that down before you can count to 10. It has all natural ingredients that Mommy feels good about. She loves knowing that Hill's Ideal Balance creators care as much about what is going into my body as she does. Of course, I can't forget to talk about the treats. Whenever Mommy leaves the house and I can't come with her, she always gives me a treat. That is her way of reassuring me. 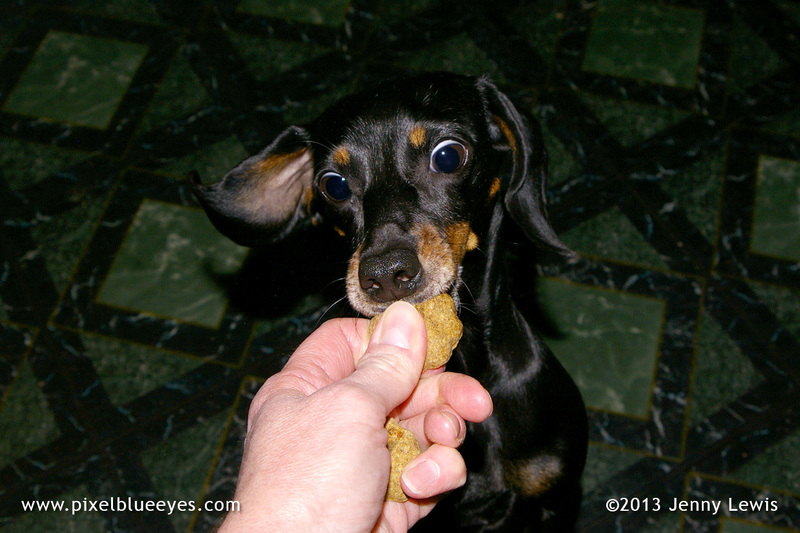 Without fail I always do at least one full twirl for her, then I gently take the treat from her hand. She loves my pirouettes, and I love the treat (and her of course), so we both enjoy our ritual. Mommy makes me feel special by giving both treats and attention to me. 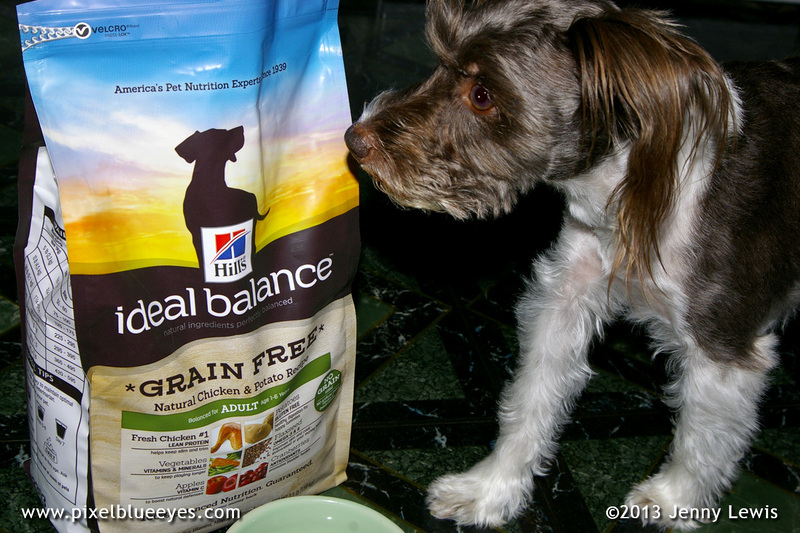 Hill's treats are yummy and so nutritious...a perfect balance of nutrition when given in conjunction with Hill's Ideal Balance wet and dry food. Well, I am sure by this time that you are incredibly hungry, I know I am just talking about it! 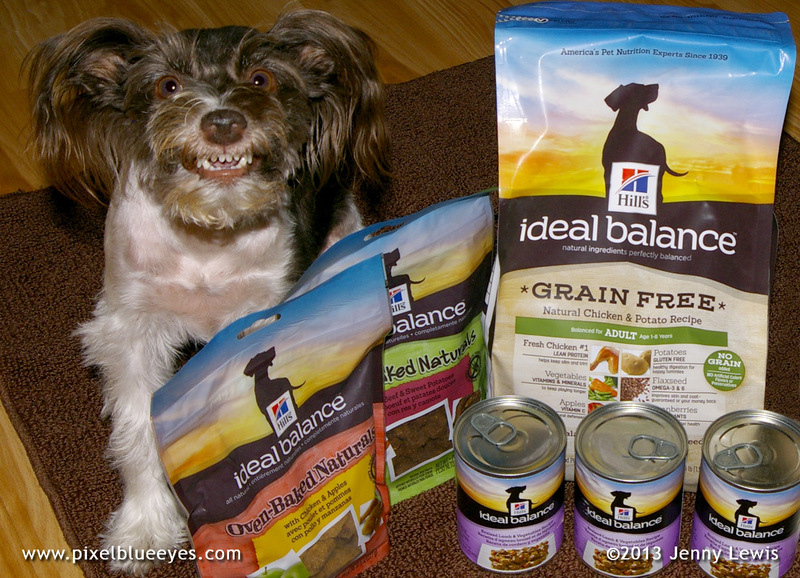 What if I told you that I am giving away 20 Hills' Ideal Balance Gift Basket to 20 lucky recipients...10 for cats and 10 for dogs? It's true friends!! Are you excited to try this wonderful, well balanced gourmet food for yourself? Then keep reading and I will give you ALL the details. Now, just because I talked about the dog food doesn't mean I'm leaving ALL my many cat friends out. 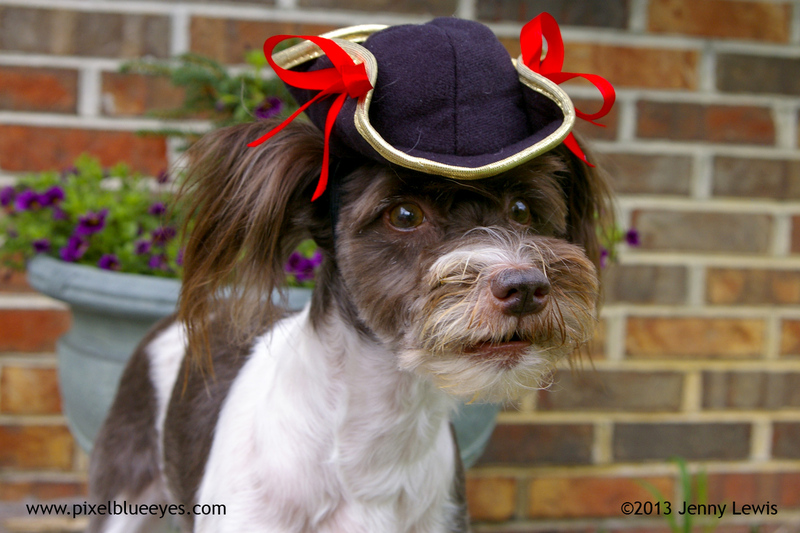 I'm an equal opportunity puppy. First, I will tell you all the goodies that are in each cat and dog giveaway, then I will tell you what you have to do to have your name put in the running to win. Of course there will be two sets of drawings...10 names will be drawn for the cat gift baskets, and 10 for the dog gift baskets. 1. Sign up to follow my blog on the right side of this post by selecting the "Join this Site" button. Leave me a comment letting me know you've completed that action and tell me why you think Hill's Ideal Balance is a good food to try and why you would like to get the gift basket. Any reason is a good reason. 2. LIKE my Pixel Blue Eyes Facebook page, then post on my wall telling me you've done so and explaining why you think Hill's is a good food to try and why YOU'D like the gift basket. 3. Follow me on Twitter (@pixelblueeyes), then send me a tweet telling me why you think Hill's is a good food to try and why YOU'D like the gift basket. If you do more than one, your name goes in the drawing more than once. Pretty cool huh! **NOTE: Make sure to tell me if you want the cat basket or the dog basket. I will immediately put your name in the cat or dog drawing. I will have the drawing on SUNDAY NIGHT, SEPTEMBER 29, 2013 and and announce the winners right here on the blog in a special post. Don't forget to check back here to see if you won. If you are a winner, I will then have you email me your Address and contact information so we can be sure to send it out to the right place. Just think, any one of you could be a winner!! And there are 20 winners! 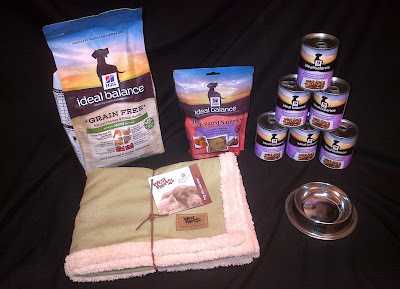 Each of you will get a fantastic Gift Basket from Hill's Ideal Balance delivered to your door. **NOTE: Unfortunately, this giveaway is only for those with a U.S. address. Please forgive those limitations...if I could, I'd make this global! I love all my friends from all over the world. The Joy of the U.S. Constitution - Happy Constitution Day! 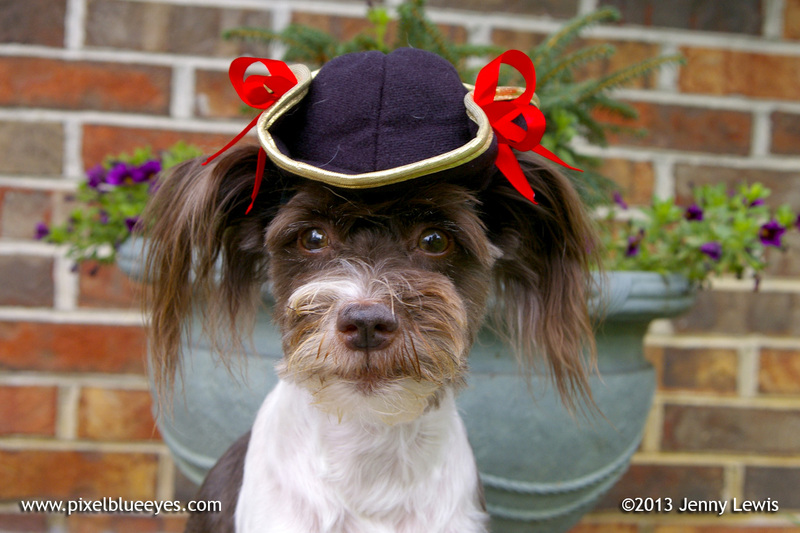 Happy Constitution Day friends! I just found out this morning about this fantastic American holiday that not many people are aware of. Thanks to the NPR radio show "Your Weekly Constitutional", I found out that on this date in 1787, our founding fathers came together to sign the Constitution of the United States. I felt it best to dress up in character again to talk about this very important day. Please, call me Alexandra Hamilton. The Constitution outlines some of the important guidelines that form our U.S. government. Here is what the very beginning of it states: "We the People of the United States, in Order to form a more perfect Union, establish Justice, insure domestic Tranquility, provide for the common defense, promote the general Welfare, and secure the Blessings of Liberty to ourselves and our Posterity, do ordain and establish this Constitution for the United States of America." Has a nice ring to it, don't you think? You will have to read the whole thing on your own...it's really a great read, and as my Mommy's college history professor once told her, "Every American should have a copy of the Constitution and Bill of Rights available at a moment's notice, and should read it on occasion since it is the basis for how things are run in this country." 1. A handful of Constitution signers also signed the Declaration of Independence a decade before: these gentlemen include: George Read, Roger Sherman, Benjamin Franklin, Robert Morris, George Clymer, and James Wilson. 2. The signers of the Constitution came from varying backgrounds. There were doctors, lawyers, ministers, plantation owners and merchants. I wonder how many of them had dogs? 3. Thomas Jefferson did not sign the Constitution. He was in France during the Constitutional Convention, where he served as the U.S. minister. John Adams was serving as the U.S. minister to Great Britain during the Constitutional Convention and did not attend either. 4. Of the forty-two delegates who attended most of the meetings, thirty-nine actually signed the Constitution. Edmund Randolph and George Mason of Virginia and Elbridge Gerry of Massachusetts refused to sign due in part due to the lack of a bill of rights. The Bill of Rights came later on. 5. Some of the more famous signers of the Constitution include George Washington (the only Virginia representative who signed), Alexander Hamilton, Benjamin Franklin and James Madison Jr.
Well friends, I hope you enjoyed this sneak peak into one of the most important documents in U.S. History. Every American should learn more about our U.S. Constitution, Bill of Rights, and Declaration of Independence. It helps define who we are as a country, and deserves to be learned about, protected, and celebrated. 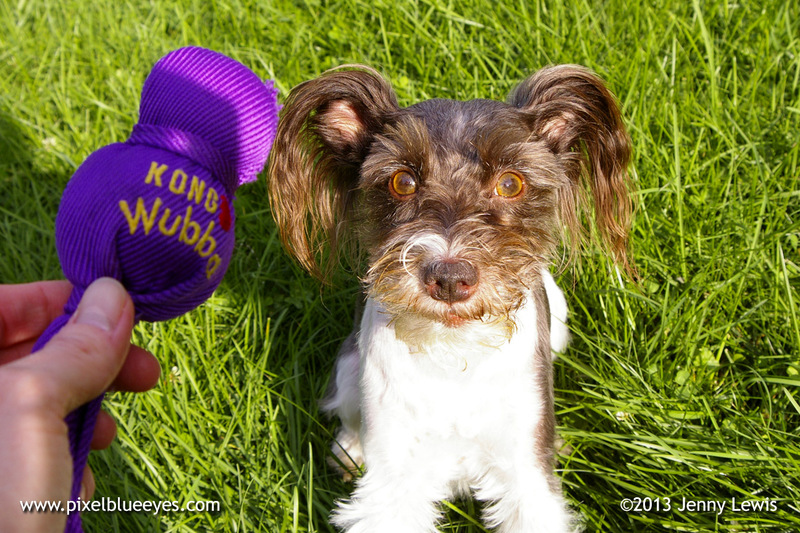 Anyone who has known me for any length of time knows that I LOVE Kong Wubba toys. Heck, I've talked about them so much, you can just "Google" the term Kong Wubba and part of my name and a page full of results will be returned. 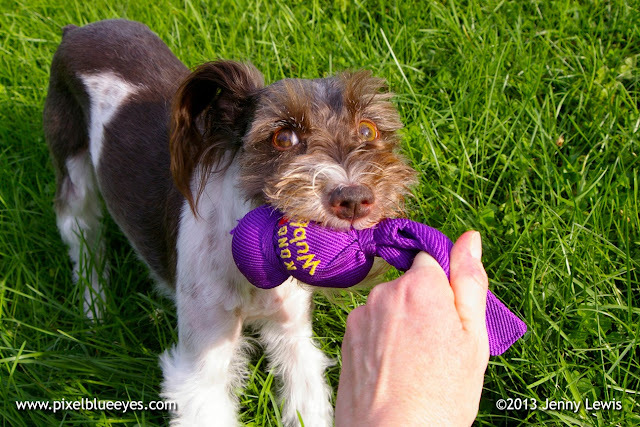 Well, here on this lovely and Fit Doggy Friday, I wanted to share my latest play date with my favorite person ever, MOMMY, and my favorite toy ever, WUBBA!! I've heard that you should try to make exercise fun, so I take that concept VERY seriously. 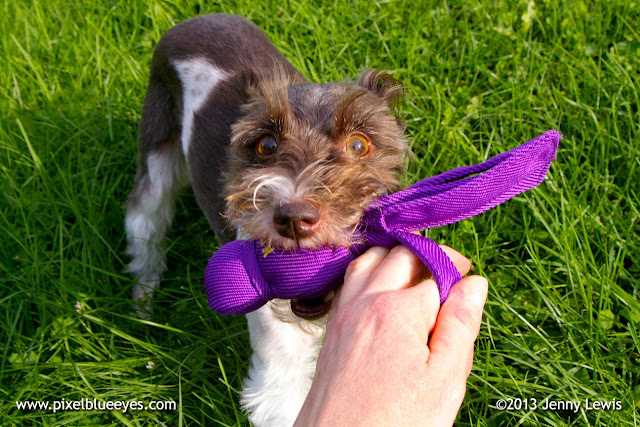 I know, I know, it almost seems like on oxymoron to say "make exercise fun" but if you follow the Pixel Way for exercise, you and your dog will be as fit as a fiddle (whatever that means) and will have had a great time in the process! Are you going to throw it Mommy? 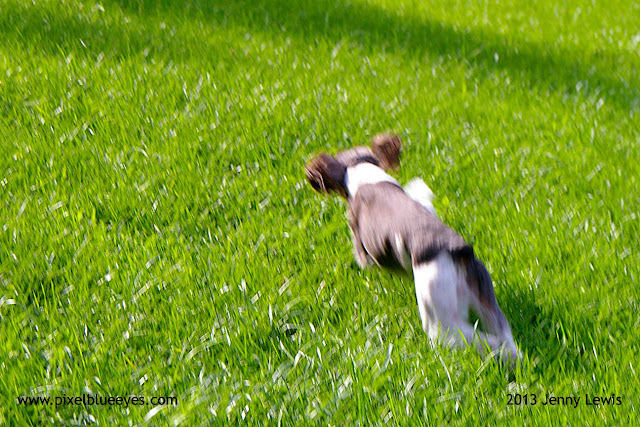 Wow, Mommy threw it so far...look at me, I'm running so fast I'm a blur!! 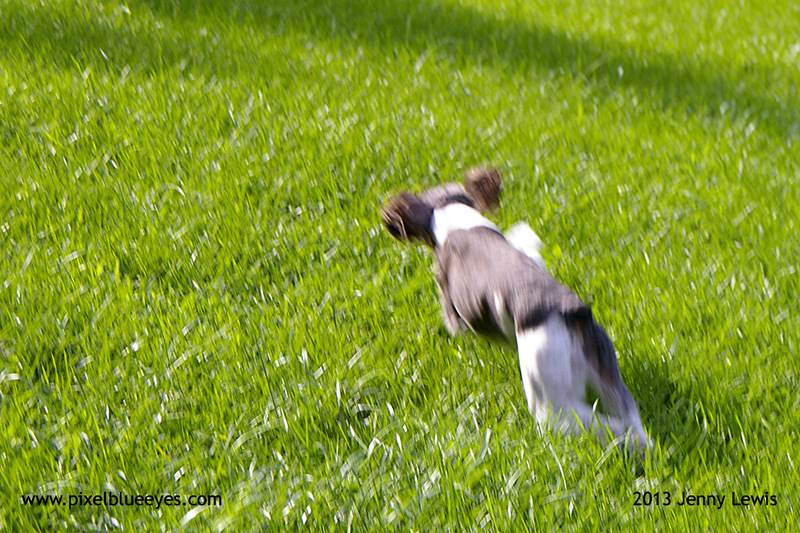 Sometimes Mommy chases me and it is so much fun! Here Mommy, I brought it back to you. I'm ready for you to throw it again Mommy. I love playing tug of war with Mommy. Please throw it again Mommy, I'm on a roll! And look, I'm sitting pretty for it too. Hahaha, got you Mommy. Bet you weren't expecting me to get so "up close and personal" BOL!! I love you Mommy!! Thank you for such a fun time outside. 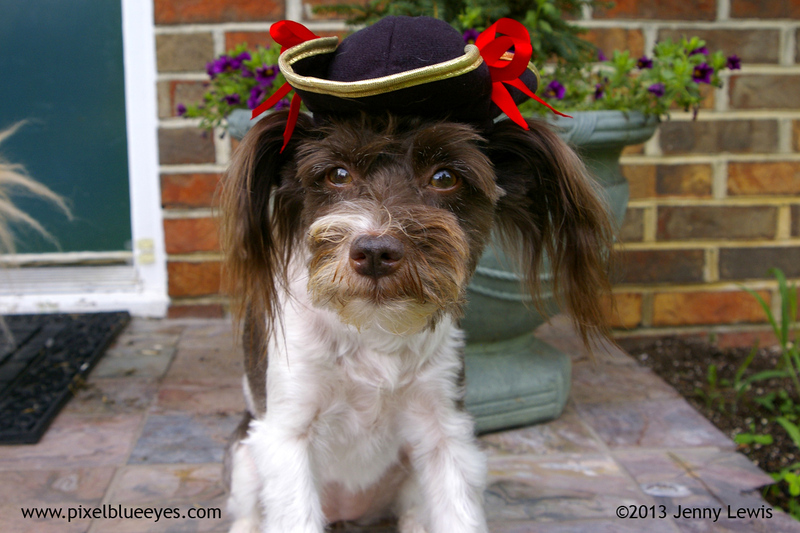 This is just one of several ways that Mommy and I make sure that exercise is fun for me...and of course for her. Have a great day my friends and leave a comment telling me how YOU try to have fun with exercise. 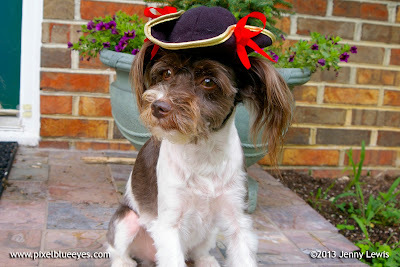 Special thanks to Slim Doggy, Peggy's Pet Place, and To Dog With Love for hosting this Fit Doggy Friday blog hop! Come on, join in...you know you want to! Direction are at the bottom of the links. Have fun!! My friends, you know that I am a natural kind of dog that tries to stay as healthy as I can. Mommy and I both believe things should be simple, pure and as natural as can be. 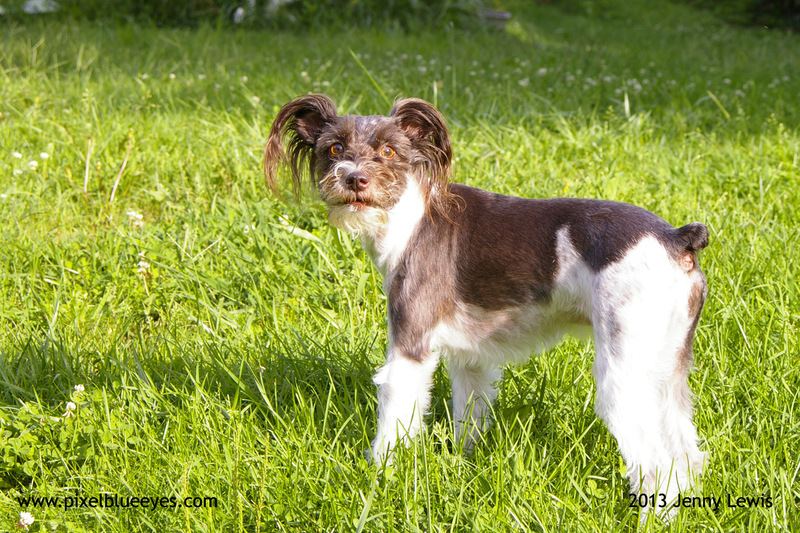 I've shared many an adventure where I've explored the great outdoor woods, celebrated the joys of little things, and shared wonderful food that Mommy has made for me that was all natural. I also believe that a healthy life is about balance. I love to play & exercise, but I get plenty of rest to balance that out. 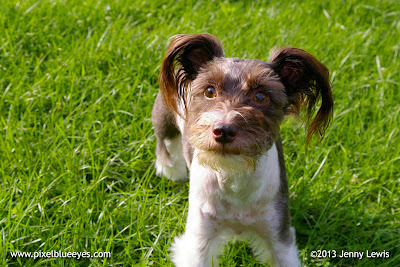 I love to learn new commands and tricks, but Mommy always makes sure that I only have fun with it. And, of course, I love to eat good food and treats that are a wonderful balance of nutrition. That is how I stay in top Pixel shape. Well, imagine my joy when I was asked to try a new and all natural grain free dog food by Hill's called Ideal Balance. 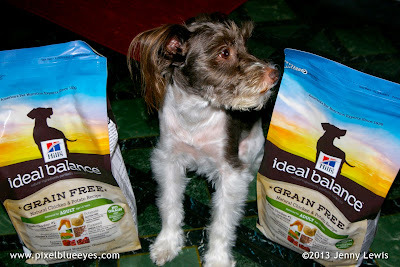 This dog food is unlike most other dog foods, in that Hill's really does believe in a perfect balance of nutrition and safe, natural ingredients. 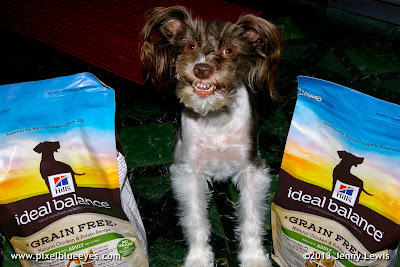 Hill’s Ideal Balance has no corn, wheat (which I especially like since I’m a wheat free dog), soy, artificial colors, flavors or preservatives. In fact, their healthy, all natural ingredients, such as real chicken meat, potatoes, peas, carrots, apples, cranberries, and flax seed, are guaranteed, or your money back. I was very excited to try it out, so we had some sent to us. It seemed like forever before it finally arrived, but it was well worth the wait! 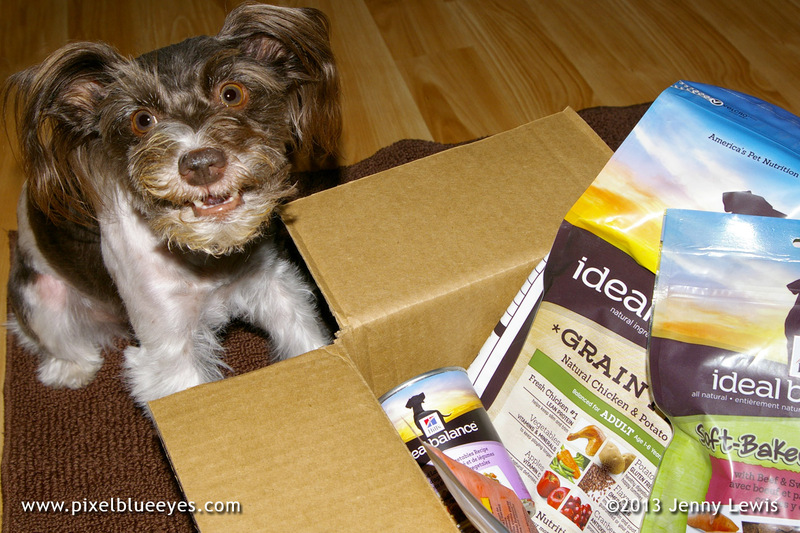 When Mommy opened that box and I saw those wonderful bags of new, all natural dog food to try, I couldn't help but give Mommy the biggest smile I could muster! 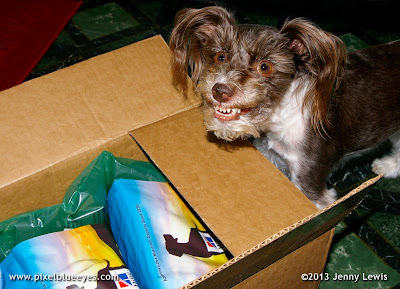 Oh, the excitement of getting a new yummy food that is safe to eat is always a highlight to me and my sisters. 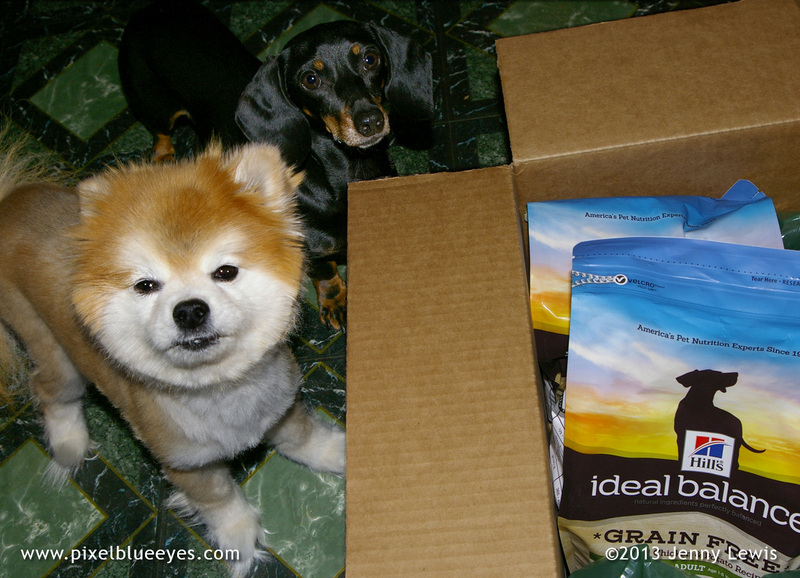 Peanut (the Pomeranian) and Dixie Mae (the Dachshund) were both excited about this new food too. 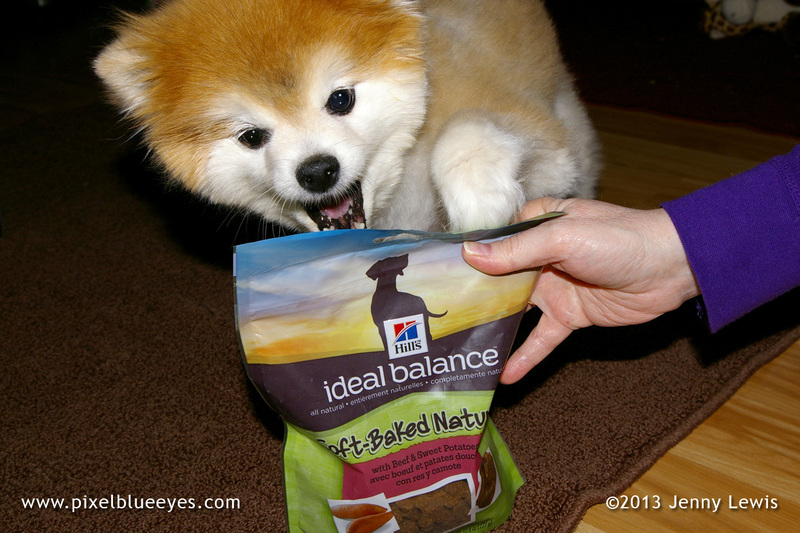 Mommy said that only the very best ingredients go into the making of Ideal Balance. 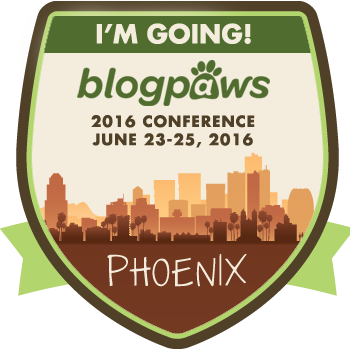 In fact, I remember getting to meet Dr. Kathy Gross at the BlogPaws conference back in May. Dr. Gross is a nutritionist at Hill's who was instrumental in the development of Hill's Ideal Balance pet food. 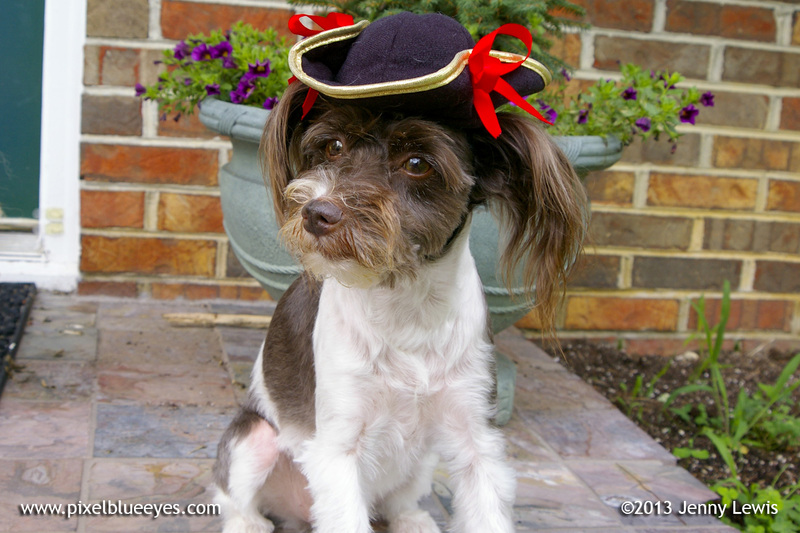 She said that dog health, and of course cat health, is very important to everyone at Hill's. 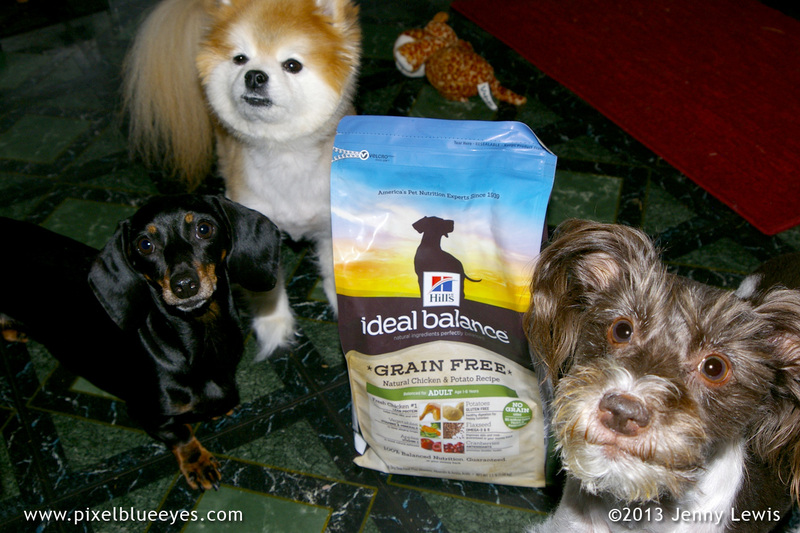 When Mommy researched about Ideal Balance, she felt good knowing that Hill's sought significant consumer input on its pet food to better understand what pet parents wanted in a natural pet food. The new, breakthrough packaging reflects the quality expected from Hill’s, showcasing the balanced ingredients inside. It outperformed other natural brands in "standing out on the shelf", looking unique and being viewed as a high quality product. ...at least that is what Mommy said. I said it looks yummylicious and it made me want to jump inside the bag right away and do my own taste test. When Mommy was doing research about the food, she got to see the making of Hill's Ideal Balance pet food commercial, where they really highlight the idea of balanced nutrition for pets. Mommy pulled out her portable tablet and showed me, Dixie Mae and Peanut the making of the video too. We were very interested in how they used the latest technology to make the commercial. Mommy said we looked pretty enthralled as you can see from this photo. 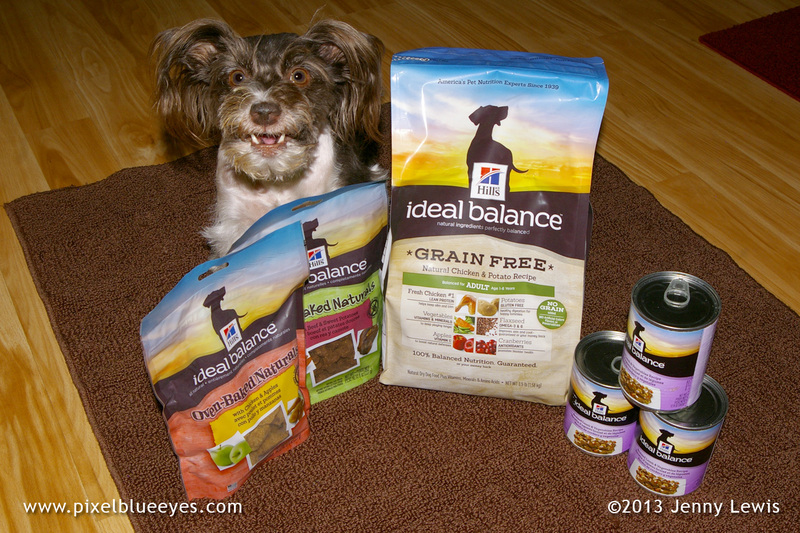 Hill's created commercials set in a hyper-realistic world of balanced nutrition for dogs and cats. In separate commercials, they follow a dog and a cat as they discover the world of Ideal Balance. 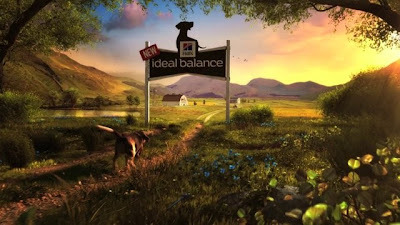 Along the way, the pets journey through the balanced elements that make up Ideal Balance: Perfect proportions of what pets need to be healthy – not too much, not too little. After we learned all that in the "making of the video", we got to see the actual commercial with all the super cool special effects that made the dog look so beautiful, healthy and like he was walking in an amazing looking world of perfect balance....we REALLY got excited! We were barking and telling Mommy we couldn't wait to try it ourselves. Talk about getting the consumer interested in the product...we LOVED watching how they made it and then watching the actual commercials. As a matter of fact, I think they should do even MORE commercials, and that maybe they would to use ME in their next Ideal Balance commercial. I mean, I have mastered perfect "balance" while doing my twirls and can do all kinds of commands and tricks on cue. 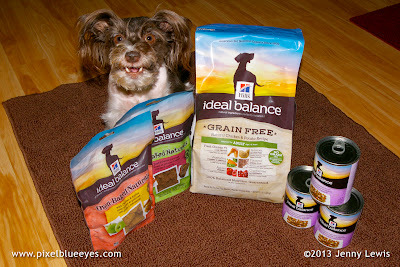 Here is the "Behind the Scenes" video showing the making of Hill's Ideal Balance pet food commercials. 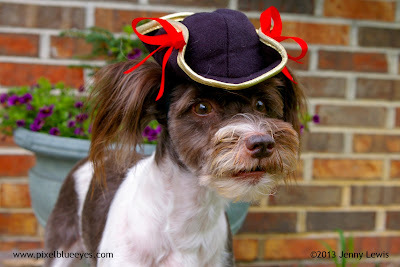 And here is the amazing commercial they made for the dog food...it is such a beautiful thing! Mommy cut open the top and saw that the packaging is high quality with a really neat resealable zipper type seal. 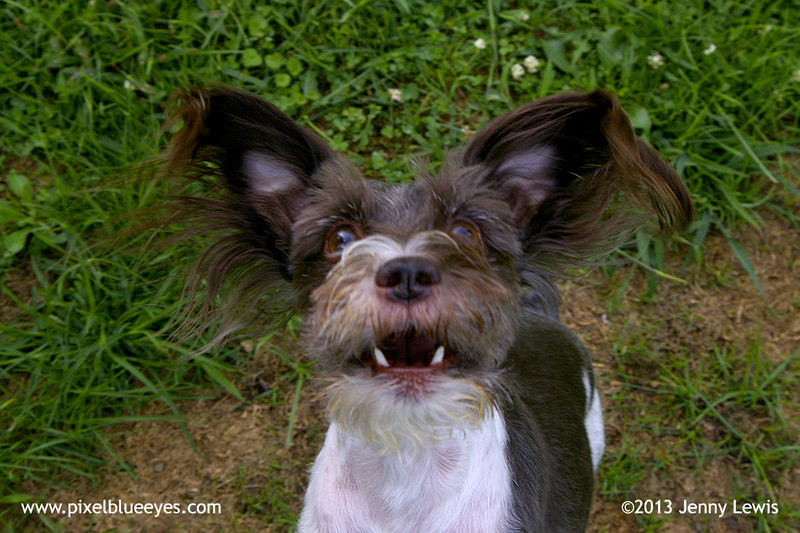 I, on the other hand, was so excited I stuck my head in before she could say a word! Don't worry, she was able to stop me before I downed a huge mouth full....unfortunately! "Wait Pixel," Mommy said. "Remember...this food, and our eating habits, are all about balance. Not too much, not too little." She measured out the perfect amount for me, based on my weight (12 lbs) and how many times a day I eat. I get 3 square meals a day, plus occasional snacks, so this equates one of my meals. 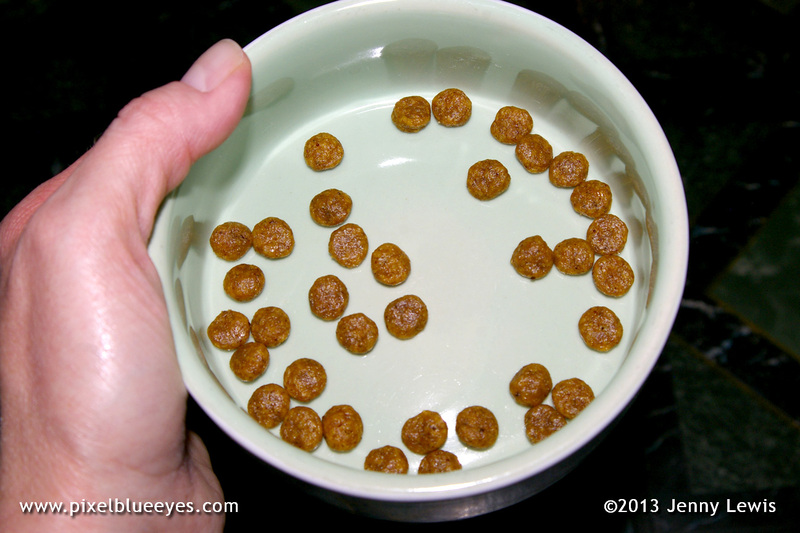 Look at how nice and well formed those kibbles are. It smells real good too! 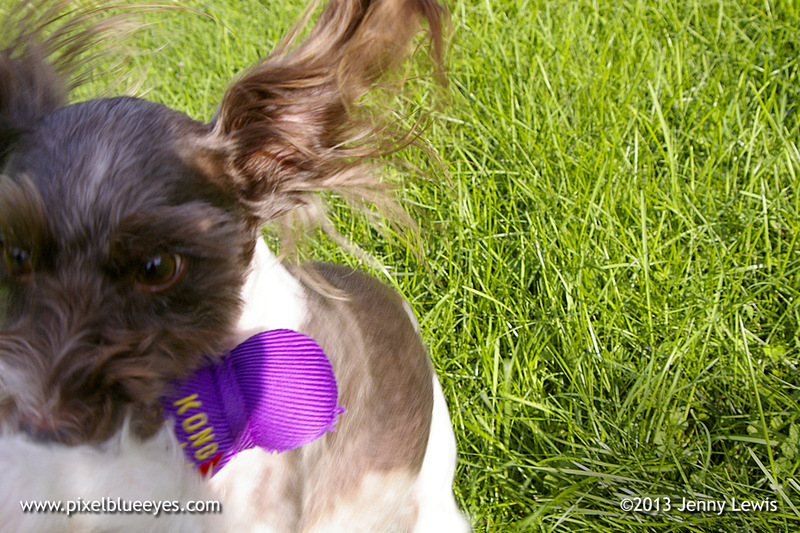 She set it down for me and I scarfed it up so quickly, she almost didn't get a photo, BOL!! I told her it was delicious!!! I give it two paws up in taste, texture and crunch! So Mommy, when is my next meal time again? 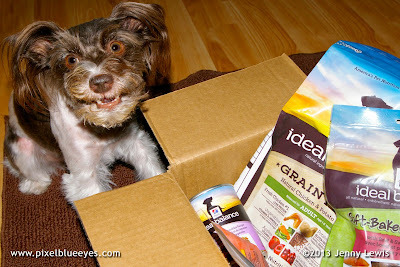 Well, now that you know a little more about what went in to making this amazing new, natural pet food – go out and get some for your own family, and see the difference perfectly balanced natural ingredients can make. 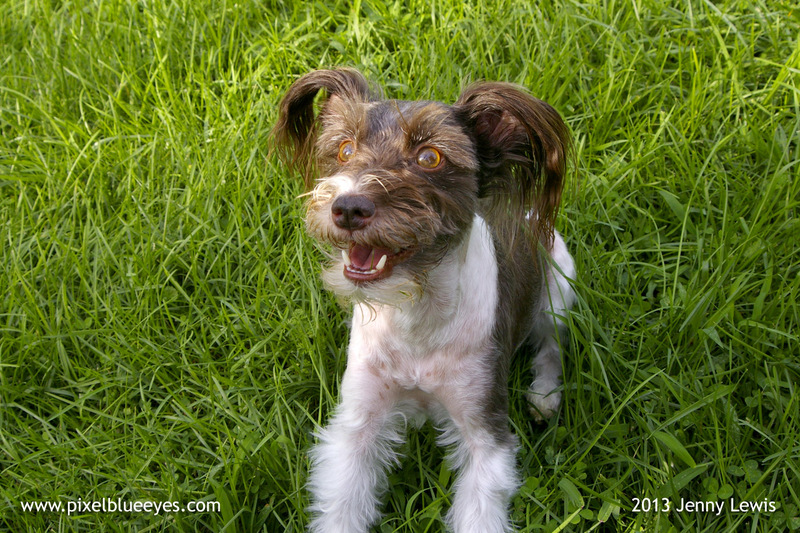 Take it from me, Pixel Blue Eyes, I promise you'll be glad you did! Hill’s website offers all sorts of information on the products, including where you can purchase them, online or in your neighborhood – and you can even try it free with the rebate offer! Disclaimer: Author has been compensated for completion of this article. Hill's Pet Nutrition, Inc. is not responsible for the content of this article.